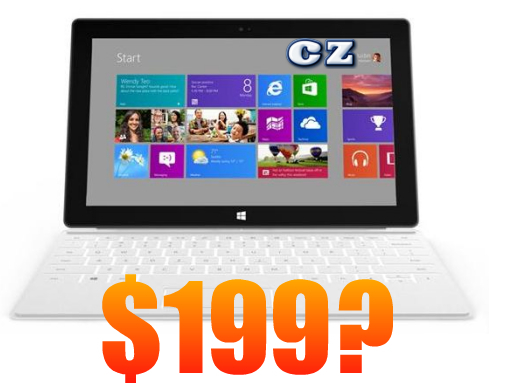 Microsoft Surface RT Tablet for $199? SOLD! Fresh rumors in the tech sector are circulating about the pricing of the Microsoft Surface RT tablet computer being introduced at the amazing bargain basement price of $199. Part of me wishes this rumor had credence. But could it possibly be based on a shred of truth? Analyzing the facts, we would have to say no. We know that Microsoft will only have a limited number of Surface RT tablets available for retailers to sell when it first hits the market. And we also know by the law of supply and demand that if demand far outweighs supply, you don't get bargain basement prices. I'm not so sure that Microsoft would be in the business of selling the Surface RT as a loss leader just to get people buying apps, somewhat like Amazon is doing with the Fire tablet. But if you consider the price of the XBOX 360 and Kinect and how much technology they employ, it might not be that far fetched. Plus, Microsoft made the statement that the Surface RT would be "priced close to what similar ARM based tablets are being offered". Everyone assumed they were comparing "Apples" to Microsoft "oranges". In other words, drawing a comparison of the entry level Surface to the entry level iPad 2 at $399. But tech writers are now talking about the possibility of the Surface RT being compared to the Kindle Fire or Google Nexus 7, both of which are ARM based devices but comning in at $199. This is a valid argument. I don't want to get my hopes up just yet, but I'm praying that this is the case. If you took a Surface RT and stripped it down to the basics with no keyboard, case, or Microsoft Office package, it is possible that you could price it at $199. This could be a break-even point or even loss leader. As slick as the new case and keyboard are, savvy buyers would likely opt for these things at the time of purchase or shortlly thereafter. And with the availability of the Office suite, it would be a sensible upgrade for business users or students. That would bring Microsoft plenty of profit if they do end up going with the $199 entry price point. I'll be writing soon about the Google Nexus 7 and the rumored 2nd generation Kindle Fire as viable $199 tablet options. But I'll tell you right now, the Surface RT would trump both of them immediately for me. I would be the first to get one fo $199, and the keyboard purchase would come shortly thereafter. What are your thoughts? Would you opt for a Nexus 7, 2nd Gen Kindle Fire, Surface RT, or a more expensive tablet like an iPad 2 or 3? Sound off in the comments!